Today’s subject, Kingdomino, won 2017’s Spiel des Jahres award, the tabletop industry’s equivalent of a Best Picture Oscar. It was the first regular win for Bruno Cathala, one of the more respected designers working in games today, author (or co-author) of such celebrated releases as Five Tribes, Cyclades, Shadows over Camelot, and 7 Wonders Duel. Has this great designer finally landed a mainstream hit that will be able to win over those outside the gaming community? Let’s talk about it. 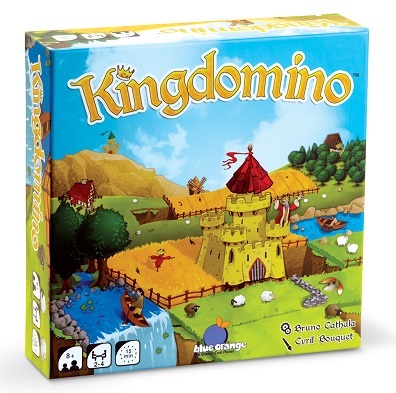 Kingdomino is a new take on the ageless game of dominos, and if the fact that you can find a version of it on the toy shelves of a big, non-specialized store like Target is any indication, then the game has certainly reached the masses. Easy to teach and even easier to learn, Kingdomino earns its broad appeal as a game that can be picked up and enjoyed by novice gamers and seasoned strategists alike. A small box that provides easy set-up and a 15-20 minute playtime helps make it into something people will carry along to friends’ houses to shake up the post-dinner party doldrum. Your kingdoms won’t have any value until you select tiles featuring a crown. At the end of the game, you’ll count up adjacent squares of that land type and then multiple it by the number of crowns you’ve collected on it. (So, five adjacent sea tiles with two crowns are worth ten points.) No tricks, no hidden numbers – the scoring of Kingdomino really is that simple. Naturally the domino tiles with crowns on them are going to be the most desirable. Each one features a unique number on the back, with the most valuable ones showing the highest numeral value. On each turn, players will pick their next tile in order of the last round’s highest to lowest-valued selections. As the player who got stuck with a tile they might not have needed will always get their pick of the next round’s selections, the game does its best to keep anyone from running ahead in scoring too early in the game. And so, Kingdomino is wodnerfully simple. You pick a tile, place a tile, pick, place, pick again and place again. Before you know it, your kingdom has taken shape before you and it’s time to add up everyone’s scores. Our four-player games of Kingdomino were over in roughly 20 minutes, making it the sort of game you’ll probably knock through two or three times whenever it hits the table. And because of the keen box design – you can shuffle the tiles when you’re done and put them back into a compartment you’ll draw them from next game – there’s little set up outside of lifting the lid. It’s primed for rematches. For the more seasoned gamers, we’ll point out that Kingdomino has a lot in common with our perennial favorite tile-layer, Carcassonne. 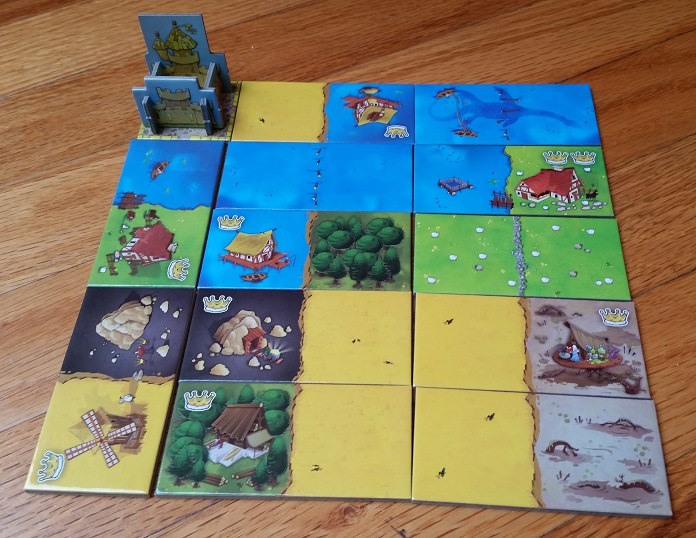 While the former has each player selecting tiles and building their own little kingdoms, the latter has players randomly drawing tiles from a bag and adding them to one shared landscape. Carcassonne feels like a longer, meatier game – with a good deal more strategy – but the scoring is certainly more convoluted, which is enough to put off some casual players. Meanwhile, Kingdomino is lean and mean, and you’ll never run into a session that feels like it’s stretching on just a bit too long. Kingdomino is probably the better gateway game of the two, as it’s based off a game everyone’s played before (dominos) and is so easy to pick up. One of our test groups included a child, her father, her uncle, and grandmother, and everyone enjoyed themselves. Kingdomino is the sort of game that has no barrier to entry, yet features enough of a puzzle to keep gaming vets invested over many play-throughs. Kingdomino is published by Blue Orange Games. Kingdomino inspired a sequel game, Queendomino, while this column’s playlist was inspired by an O.G. domino, Fatsdomino. Or, Fats Domino, that is, a.k.a. The Father of Rock ‘n’ Roll. Born in the Big Easy in 1928, young Antoine Domino, Jr. was already playing piano in New Orleans bars by the time he was a teenager. His first single, “The Fat Man,” was released in 1949, and had sold over one million copies by 1953 – it’s widely considered to be the first rock and roll record to have ever done so. His songs – including famous recordings of “Blueberry Hill” and “Ain’t that a Shame” – ruled the charts for the next decade, up until the Beatles arrived and changed young listeners’ tastes in pop. Still, Domino remained a respected and influential artist for the rest of his career, particularly in New Orleans, which remained his home. In 2005, Domino was mistakenly reported to have died in Hurricane Katrina – he hadn’t, though he lost much of his personal recordings. Instead, he spent the remaining years of his life helping in efforts to rebuild the city after the storm. Previous PLAYlist columns: Citrus, History of the World, Altiplano, Pioneer Days, Crystal Clans, Jurassic Park: Danger!, Photosynthesis, Ice Cool, Food Truck Champion, Ars Alchimia & Lemuria, A Game of Thrones Catan, Troyes, Twilight Imperium: Fourth Edition, Flip Ships, NMBR 9, Unearth, Escape from 100 Million B.C., Orleans (plus Trade & Intrigue), Whistle Stop, Caverna: Cave vs Cave, Twilight Struggle, Honshu, Bärenpark, Notre Dame & In the Year of the Dragon, Yokohama, Clank! A Deck-Building Adventure, Villages of Valeria, New York Slice, Watson & Holmes, Hanamikoji.